Pizza is just one of those foods that I could eat every single day for the rest of my life. I absolutely adore it in all forms, and am always willing to try just about any new Weight Watchers Pizza Recipes that I find. A long time ago, I came across Flatout Flatbreads, and have been using them in a variety of personal sized, thin crust pizza recipes ever since. But it recently came to my attention that not everyone is aware of Flatout Flatbreads (and their whole amazing line of products), so I thought it’d be beneficial to post a simple pizza recipe that is made with one of these low calorie flatbreads. The options for Flatout pizza recipes are endless, but I think the key when making them is to use a decent amount of cheese. I typically use about 1/2 cup on my thin crust pizzas, and I think it works great. Sure I could do less and shave a point or two off the total Points, but what is pizza without CHEESE?! The Points are worth it, in my opinion. And because there is a TON of fiber in these flatbreads, they are very satisfying and will help keep you full for quite a while. So, if you are a pizza fanatic like moi, get in the kitchen with some Flatout Flatbreads, and share your favorite low calorie pizza recipe with us!! A quick and easy pizza recipe that is delicious and filling. Satisfy your pizza craving while still staying on track to reach your Weight Watchers goals. Spray a large piece of aluminum foil with non-fat cooking spray, and place Flatout Flatbread on it. Heat flatbread in oven for about 8-10 minutes, or until the flatbread begins to crisp. 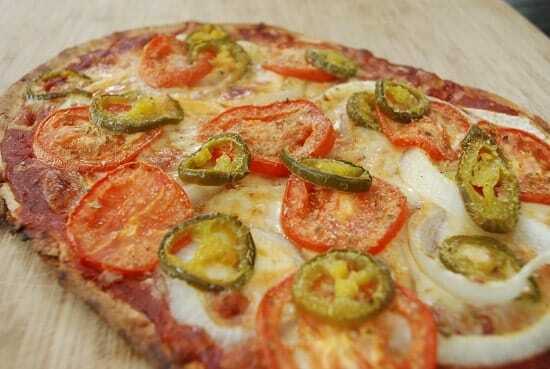 Remove flatbread from oven and top with sauce, cheese, veggies, garlic powder and oregano. Return to oven and heat until cheese is melted and pizza is cooked through, about 10-12 minutes. I just threw this in the oven. I hope i,didnt mess it up though bc i didnt bake the flat bread first, i just topped it and put it in.????? I have been making thin crust pizzas for a while now, and I deviate in perhaps only way in which you make your pizzas. Rather than use aluminum foil, and spray the crust, I use my round 13″ pizza stone. This way the crust heats up evenly and dependably. I just place the stone in the oven and give it about eight minutes to harden up some. Then I remove the stone, and load up the crust with my favorite pizza items. After that, I place it back in the oven for another 12-15 minutes. Placing the crust in the oven before populating it with goodies makes it much more sturdy and easier to handle. This is the first time I am using FillOut, and its in the oven cooking right now. I’m happy to have found them, over at my local WalMart grocery store. I have heard about these flat out pizzas for awhile and finally decided to give it a whirl tonight. I swung by walmart on way home to pick up the flatouts and the cheese, other than that, i used ingredients I already had on hand in my fridge or pantry: sun-dried tomato pesto, smoked turkey breast, bell pepper strips, baby portobellos, black olives. Delish! And this is a LOT of food. I’m stuffed! This is amazing!! I am going to make this tonight! I used to work in a grocery store and I remember these Flatout Flat breads being by the deli. Who knew! I should’ve paid more attention to them before!! Where do you buy the Flatout Bread from? Is it sold in Publix, Kroger, Walmarts?? And in what section do I need to look for it? I’ve made this 3 times this week with different toppings. So easy and good! Seems like I’m cheating! I have made this pizza twice now and it has quickly become a staple in my house. Thank you for introducing me to “Flatout” bread!!!! I love the “crispy” texture that this becomes in the oven. The only downfall is that it doesn’t reheat well in the microwave. Other than that it is a new favorite! Another great recipe! I could so eat pizza everyday too! I’m spoiled because I live near a Jule’s thin crust pizza place. Their generous slices are only 5 points+ each. I have also found Kraft FF cheeses to be great.